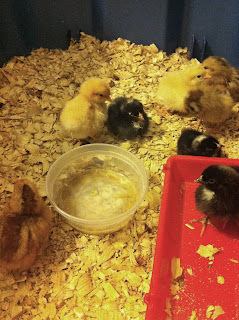 The chicks I ordered a couple of months ago are finally here. They hatched on April 11 and arrived on April 12. Our delightful postmaster delivered them to our door. She is such a sweetie. She lives right down the street from us, which, out here in the country is probably about half a mile, but, she's only about 6 houses down. So, by now, they're 4 days old. They have wing feathers already. They are adorable, but, we aren't giving them as much attention as we should. They run from us when we try to pick them up. Aves loves to pick them up and rub them on her cheek to feel their softness. Because we have them in the tote the red stars were in, I had to move the red stars outside to the shed/coop. I spread pine shavings on the floor, got them a nice large water container and food container, a small bin and some sticks as roosts. They're temporary roosts, we are making some permanent ones tomorrow. It's so funny to watch them try to climb up and down the sticks. Like walking a tightrope.